You're gonna have to call this the Model T now, you do know that? That was genuinely the first name that came out in discussion. Black nail polish is SO last Millennia!! Oh and I was so hoping you were going to fit some of those neon pink strings for full comedic effect. I like the ghost dot effect on the fretboard, but what is the plan for side dots. i suggest replacing the white dots with something metal, panel pins work quite well. 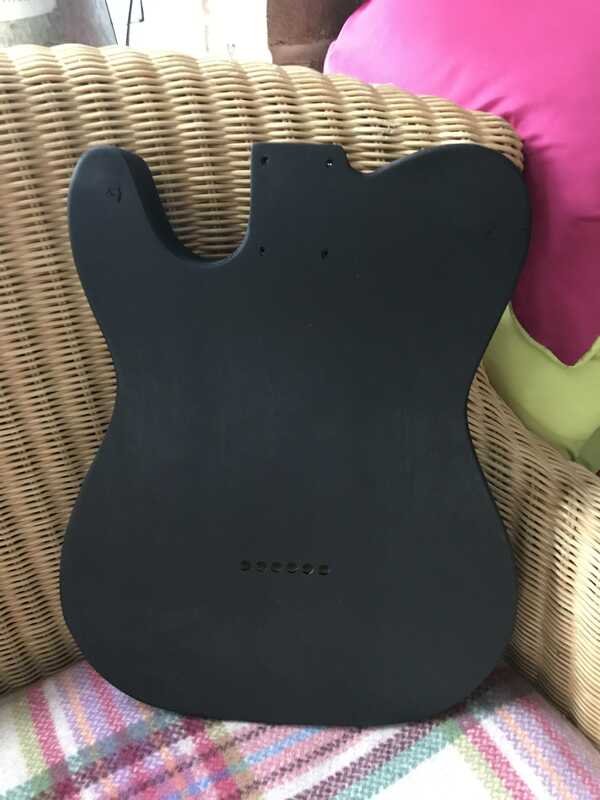 Pickguard needs to be 3 ply black/black/black. Can't sing, can't dance, can handle a guitar a little. And so cold harsh light of day and all that? 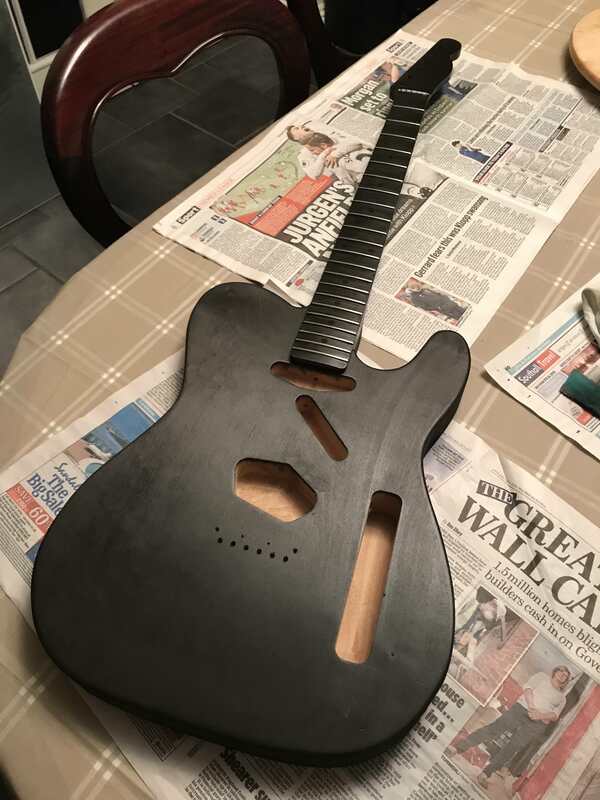 Body is looking good - couple more coats of Tru Oil and it's done. 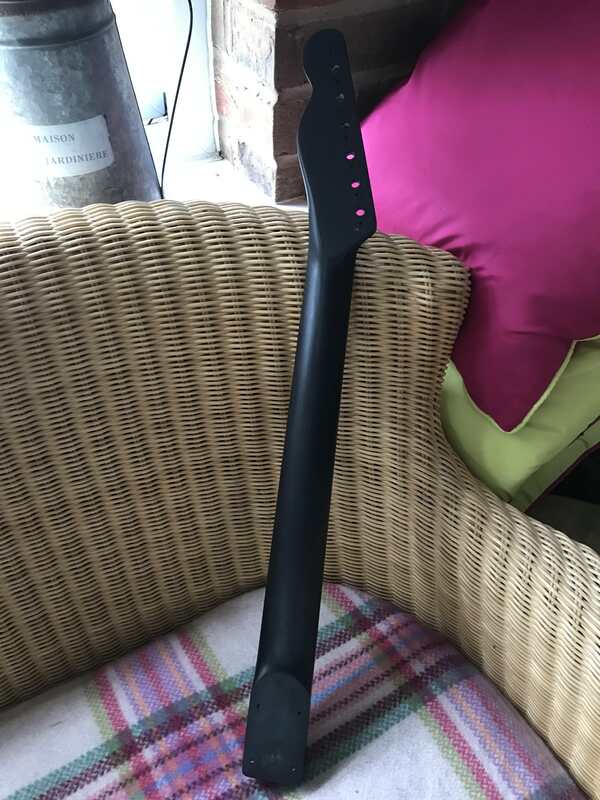 Neck is good too - again, few more coats. Blue Luminlay, man - would look extremely cool! Ink is messy. Very very messy. However, on a nice bit of wood, a really high quality permanent archive grade ink (which is what I used) does stain very nicely - it gives a very even coverage - I applied using a sponge and then wiped and rubbed in using a different sponge after the ink had absorbed for a bit. The Tru Oil took to it very well and darkened the ink substantially - as it's dried it's held that darkening. Ink is of course a mix of different colours and isn't true black - when it dries it takes on a purple tinge. The ink takes ales an hour or so to dry and absorb properly - you can see it transition in drying to a purple. Open grained woods take about two coats for good coverage - closed grain like the neck were three or four coats. I had had a small bottle of ink which cost about a fiver, and I used half a bottle. Theoretically you could Tru Oil this to the hilt and go full on gloss - but we are going for coal Black effect so will keep it satin. I was a bit skeptical about ink working - but it did - and a lot easier than I thought it would. I think the neck looks absolutely splendid! but if its going to turn purple, then maybe its got to be The Purple Nasty? It's a doddle, really! Took me about an hour and a half on my first try, installing it on one of my Jadens. 1 - Make an indentation with a pin in the centre of the existing dot. 2 - By hand, using a drill bit the exact width of the dots you're going to install with the pin indentation as a guide, carefully "drill" through the dot until no more plastic comes out. 3 - Dip the rod of Luminlay in the tiniest bit of superglue, and push it into the hole. Leave to take hold for a minute or so. 4 - Cut the Luminlay rod as close to the wood as possible. 5 - Repeat for all the other dots. 6 - File the Luminlay down everywhere, then sand with 320 grit -> 600 grit -> 1200 grit. 7 - Have a nice cup of tea, you've earned it. I couldn't believe how good, how quickly this looked. Keeps getting better as well. 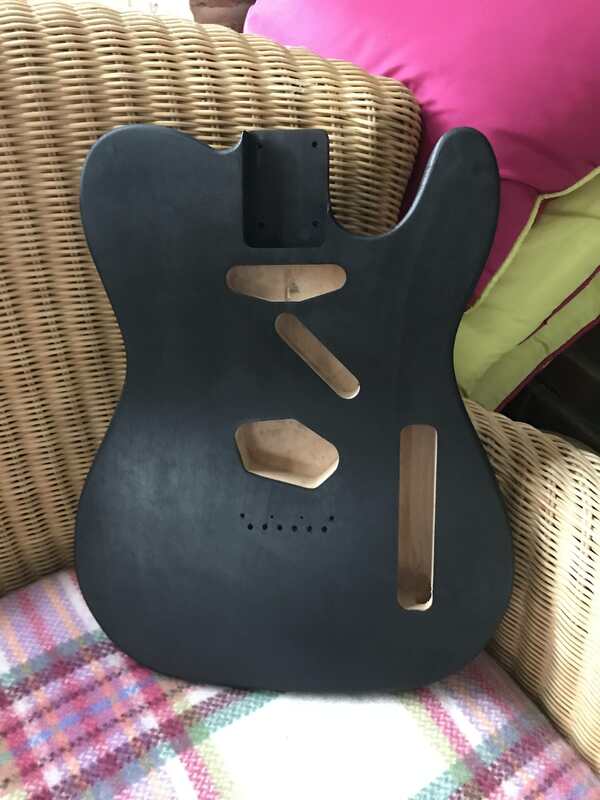 Is it black enough for @Alnico though? If there are two holes for the pickups, and one for the control panel, what's the angled one between the two pickups for? It is a Reverb Tank. Are you sure? I thought that's where the mojo goes in. Nah, it's for his guyliner pencil. Surely on this it would be a black jack rather than a mojo? Thank you, we have a name. 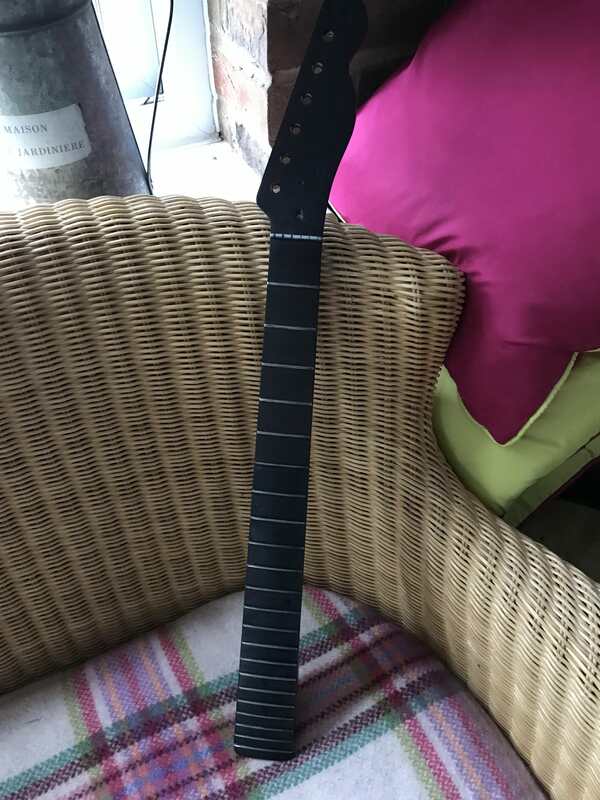 Don't Schecter make a Blackjack?